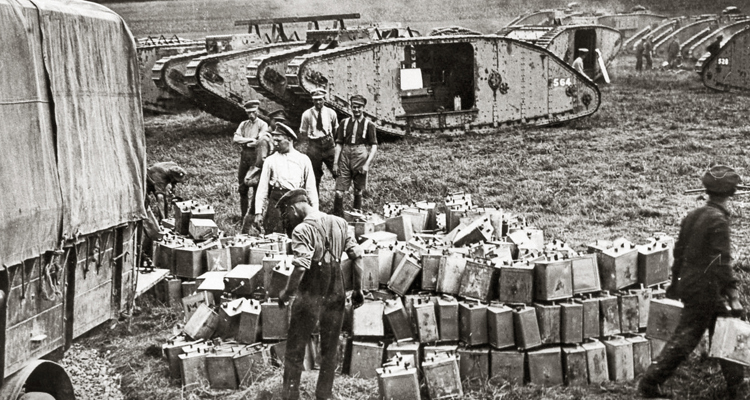 The Battle of Amiens began on the 8th August 1918 and lasted until the 11th. It was a stunning success for the Allies and marked the beginning of the Hundred Days Offensive that drove the Germans back and resulted in an Allied victory in the First World War. 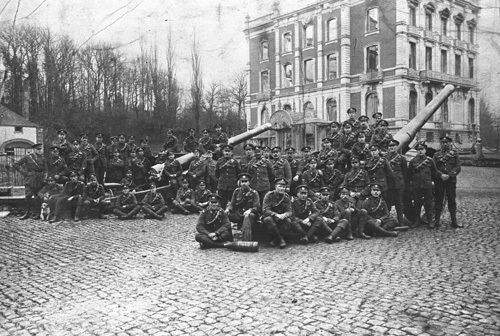 Amiens showed how capable the soldiers of the British Expeditionary Force (BEF) were by 1918. The lead-up to the battle was a masterpiece of planning in terms of both speed and detail, of administration, transportation, logistics and supply. Once the fighting began the different arms of the BEF came together in harmony to work as a system that forced the Germans to retreat, inflicting heavy losses and shattering their belief in victory. This article will look at the planning and preparation for the battle. A second will detail the course of the fighting. 6 inch Mark XIX Guns. Heavy guns like these required 400 rounds. Each shell weighed 45kg, not counting the separate propellant charge. Amiens itself was a vital road and rail hub for the BEF. It had been successfully defended during the German Spring Offensive, and now lay in the British Fourth Army’s sector, commanded by General Sir Henry Rawlinson and made up of British III Corps and the Australian Corps. During the summer of 1918 the Australians had aggressively pushed the Germans back through constant raids, a process called ‘peaceful penetration.’ This showed that the Germans in front of Amiens were manning inadequate defences and suffering from poor morale. Rawlinson began considering a larger attack. On the 4th July the Australians launched a limited, but highly successful attack at Hamel (find out more here). Rawlinson’s plan was based on what had worked there. In particular he emphasized surprise, which meant both assembling the attacking forces in secrecy, and not using a preliminary artillery bombardment. The infantry would be supported by tanks and aircraft. Importantly, Rawlinson also requested, and was granted, the Canadian Corps, the largest and most powerful Corps in the BEF. Rawlinson submitted his proposal to BEF General Headquarters on the 17th July. A week later it was approved and he began detailed preparations. Two changes were made. Firstly Rawlinson’s original date of the 10th August was brought forwards to the 8th, and secondly units of the French First Army were included in the plan. The ultimate aim of the battle was to advance to the old French Amiens Outer Defence Line. This would stop the Germans from shelling Amiens by driving them out of artillery range, improve the Allied position and do further damage to German strength and morale. This advance was divided into three stages. To reach the first objective (the Green Line) required an advance of around 3500-4000 yards. The next objective was the Red Line, between 2000 and 5000 yards further, and the third was named the Blue Line. Total distances to here varied by sector, but were between 10,500 and 14,000 yards (6-8 miles). The intention was that the units that fought to the Green Line would stop and consolidate there, then fresh troops would pass through and advance to the Red and Blue Lines, or beyond if possible. Rawlinson knew that the attack would rely heavily on surprise. If the Germans had any idea it was coming they could rush in reinforcements and reposition their artillery so it couldn’t be hit by British guns. For this reason extensive steps were taken to disguise the build-up. Firstly, many soldiers simply weren’t told until as late as possible. Formal orders were issued between the 31st July and the 5th August, with frontline infantrymen not briefed until even later. Those who did know were ordered not to discuss it in public. To hammer home the point, a small notice entitled ‘KEEP YOUR MOUTH SHUT’ was issued to everyone in Fourth Army. Movements of troops and supplies in the Fourth Army sector were restricted to night time. Supply dumps, artillery positions and tanks were to be camouflaged, and aircraft flew over the lines to drown out the noise of moving vehicles and to look for any units violating these orders. 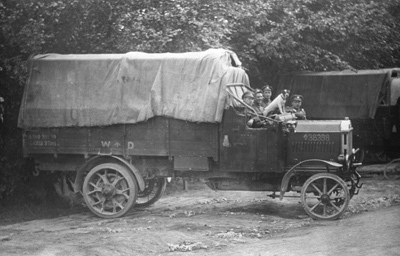 A 3-ton lorry. By 1918 the BEF’s logistic network was increasingly mechanised. The most difficult, and most important element of the need for secrecy was the move of the Canadian Corps. This was the largest Corps in the BEF, well trained and at full strength. They had a reputation as shock troops, and could be expected to spearhead any large British offensive. It was currently based around Arras, over 30 miles to the north. Moving it would be a massive undertaking. It would also be a clear sign to the Germans that an attack was planned for wherever they ended up. 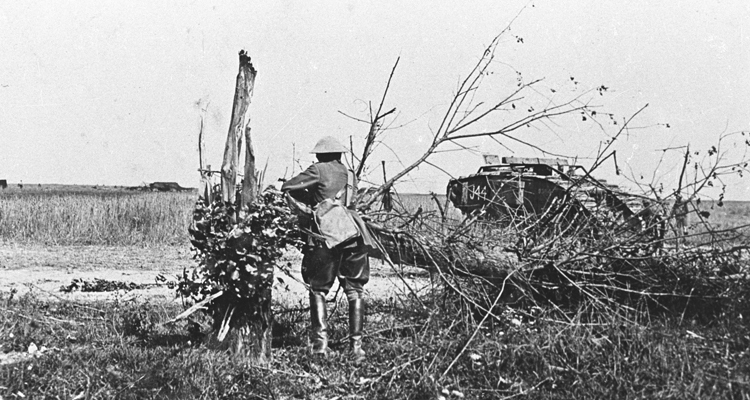 To try and deceive the Germans, two Canadian battalions were moved further north to Kemmel, with orders to simulate the radio traffic of the entire Corps. GHQ also issued a number of contradictory orders about the final destination of the Corps, including launching attacks at Kemmel or at Arras, moving them into reserve, and replacing the Australians at Amiens. This need for secrecy did cause some problems. Planning for the move had to be conducted in just 24 hours, and the move itself in nine days. The Corps was over 100,000 men strong, with hundreds of vehicles, artillery pieces and horses, and thousands of tons of supplies. There were only two roads leading into the Corps’ assembly areas, so traffic congestion was a major problem. Bringing up supplies was also a challenge. Just the Canadian Corps required over 7000 tons of artillery ammunition alone and the distance from the storage dumps to the artillery firing positions was so great that supply trucks could only make one trip per day. This required large amounts of petrol. The soldiers also needed food, water, small arms ammunition and ‘trench stores’ such as sandbags and tools. The same was true of the other two Corps. Despite these problems, and others, careful planning and staff work ensured the move was a success, with the last ammunition deliveries arriving just a few hours before the attack was scheduled to begin. From north to south the attack would be mounted by III Corps, then the Australians, then the Canadians, with the French to the very south. 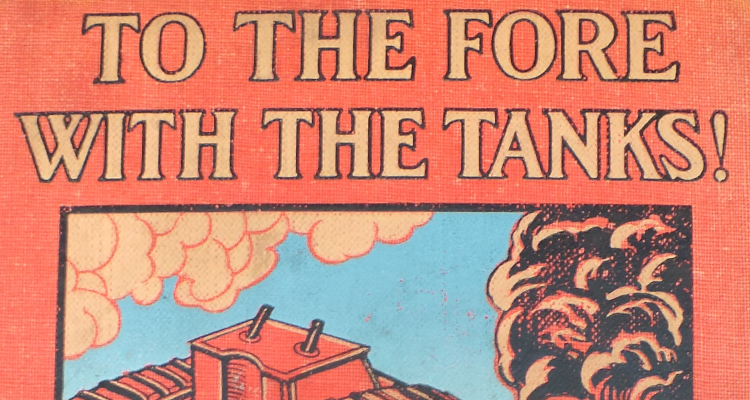 They would be supported by units of the Tank Corps and aircraft of the RAF. There would also be fast Whippet tanks and Cavalry held ready to exploit successes by rushing forwards ahead of the infantry to disrupt German rear areas. 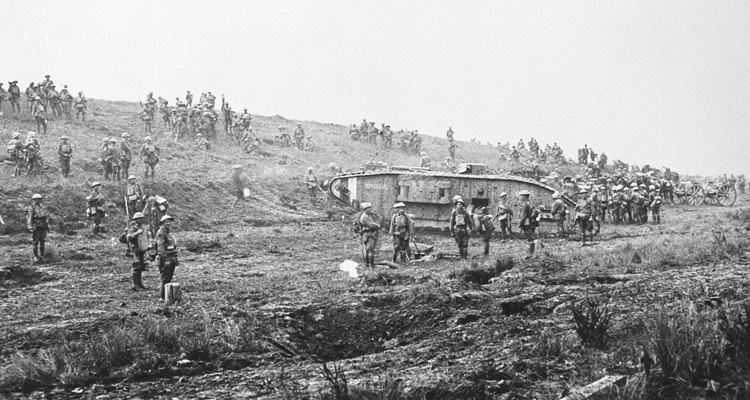 III Corps would attack on the high ground north of the River Somme, aiming to take the Chipilly Spur. This included steep slopes and gullies that could be seen from the German defences on the Spur. This was very difficult ground to attack over, and the plan seems to have recognised this. III Corps was the smallest Corps taking part in the battle and was made up of units that had lost men in the German Spring Offensive so contained many inexperienced soldiers. Their role was essentially to protect the flank of the Australian and Canadian attack further south. 954 of these 18 pounder field guns were used at Amiens, and each was supplied with 600 rounds. The stronger and more experienced Australian Corps and Canadian Corps would form the main thrust of the attack. Most of their section of the battlefield was open and flat, with few obstacles or natural defences, and it hadn’t been heavily shelled. At the southern edge of the battlefield the marshland on the banks of the River Luce would pose more of an obstacle, as would the high ground to its south on the border with the French sector. The whole force would be supported by 1300 field guns and almost 700 heavy pieces. 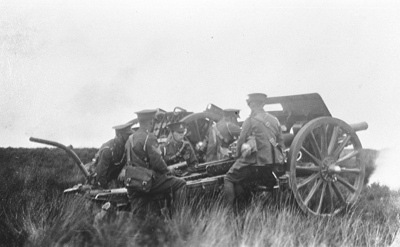 Sophisticated but well-established techniques such as sound ranging and flash spotting were used to locate German artillery, and by the beginning of the battle the positions of 504 out of 530 German guns had been discovered. Accurate surveying meant that British guns could be aimed at them without needing to fire, preserving surprise. The RAF deployed 800 aircraft to support the attack. 330 were allocated to directly support attacking units, and another 300 for attacks on more distant targets. 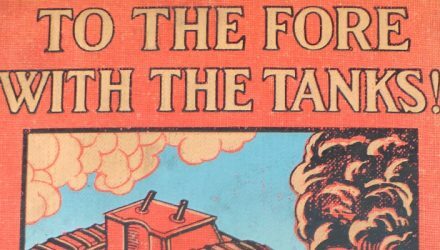 The Tank Corps could field 552 machines in 13 battalions (10 of Mark V and Mark V*, 2 of Whippets and the Armoured Cars of the 17th Battalion). This made Amiens the largest tank battle of the war. Preparing for a battle the size and complexity of Amiens would probably have been beyond the BEF 2 years earlier, and still have posed a massive challenge in 1917. 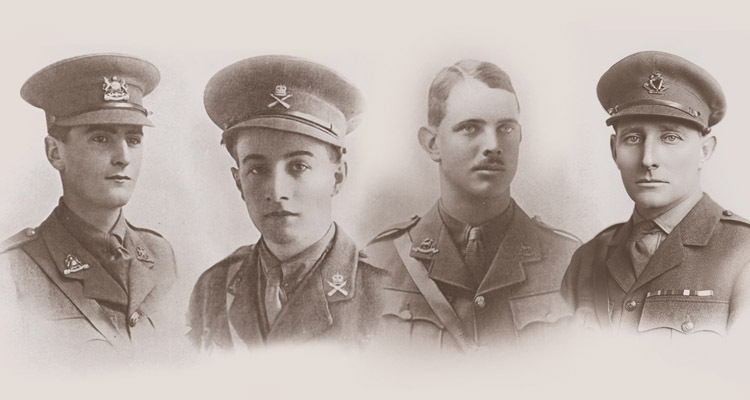 However the mistakes and lessons of earlier in the war had been learned, and soldiers across the BEF were approaching the pinnacle of their ability. Everything had come together, and early on the morning of the 8th August 1918 the BEF was ready to show what it could do. Ever heard of General Sir John Monash? He was the Australian that planned the attack at Le Hamel. He planned it so well that before the attack started he said it would take 90 minutes from start to finish. As we know it took 93 minutes. The troops that took part were largely Australian, Canadian and American servicemen. Very few British soldiers were involved. Read Monash’s Masterpiece for the true story. So this account of the Le Hamel battle and Rawlinson’s part in it is falacious.